I'm preparing for my little one's FIRST birthday this weekend...can you believe it? Remember my first post about her? Time has gone by so fast... anywho, taking my place today are Sammy and Ruth from Scraps n' Strings. Ironically, I have known Sammy since before kindergarten but when I moved away in 5th grade we lost touch. But, thanks to Facebook and blogging we've reconnected! Yay for social media! 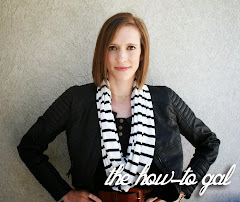 Hello to How-To Gal Readers! This is Ruth and Sammy from Scraps N' Strings and we are so excited to be doing our blog spot with Anna Rose! It truly is an honor :D. We figure we had better introduce ourselves a bit before we start. I'm Ruth and I am a stay at home mommy of 2 (3 and 1) and a part-time photographer, you can see my work here. I enjoy making "stuff" and taking pictures of them! I especially love to sew and like to break out the Mod Podge. I love anything that is quick and simple! After I got married, I started crafting with my sister-in-law Sammy as a way to make our homes cute without spending a lot of money. My name is Sammy and I have 2 darling little boys, 2 and 10 months. I'm a stay at home mom and I like to spend my zero amount of free time trying to be crafty and beautifying my home. One of the first things my husband said to me when we bought our home was, "You want to put crafts up, don't you?" So that's what I've done. And now we've decided to share some of our ideas with you! We've got a little bit of everything on our blog, from baby and home tutorials to recipes! Today we are going to show you how to make a little boys bow tie out of scrap fabric. First take your 10"x6" fabric scrap and fold it in half so that the right side of the fabric is touching and sew down the side. Do the same with your smaller fabric scrap. Turn your pieces right-side out and press with the seams down the middle. With your bigger piece, fold the ends over to meet in the middle and sew down. Next take your elastic and measure it around your boys neck. It is easiest to measure when he is wearing the collared shirt he will wear with the bow tie. Just make sure it isn't too tight or too loose. Sew the ends of the elastic together and sew the elastic onto your large fabric piece. After the elastic is sewn on, take the smaller fabric piece and wrap it around the larger piece. You can hand sew this part if you want, but I strongly dislike hand sewing so I just added a few dabs of hot glue to secure it. Fluff it up and play around with it a little to get the look you want and there you go! Thanks again Anna Rose for letting us visit! We had a blast! Love it! Can't wait to try this for my son. Thanks for posting. Thanks for the easy tutorial ! It's quickly done and the result is really nice !